You’ve probably heard that the Bureau of Labor Statistics (BLS) Employment Report for the month of May was disappointing. Economists who follow job growth in the U.S. economy were expecting 123,000 new jobs to be created. The actual number, according to the BLS, was 38,000—the smallest gain since September of 2010. What’s going on? On a scale of 1 to Lehman, how worried should we be? 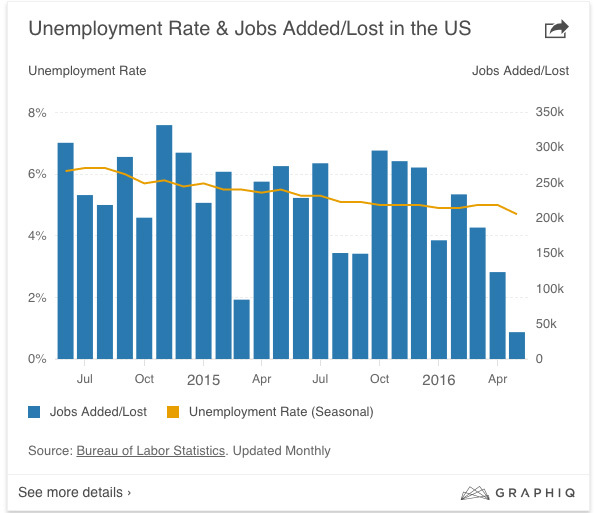 Is an 85,000 shortfall in job growth, in a single month, telling us that the U.S. economy is about to plunge into a deep recession? As it turns out, the investment markets largely shrugged off the surprising number—for a variety of reasons. First of all, a strike affecting 35,000 Verizon employees was somehow factored into the data, so unless all the striking workers are never coming back to work, a real count would have put the job-adding number at around 73,000. Second, the employment data comes with a huge asterisk: these are estimates with a margin of error of 100,000 jobs. That means we won’t actually know how many jobs were created until sometime in the future.